Unmatched performance, fast 802.11ac Wi-Fi connectivity, flawless Crystal Sound 2 audio and customizable Turbo App for your awesome X99 build. Wi-Fi GO! 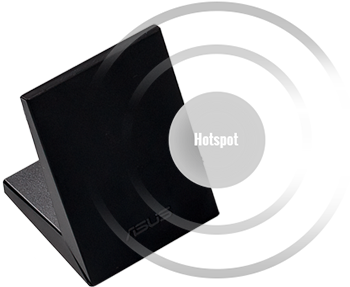 gives you complete control of your PC — even when you're away from home! Access your forgotten files at home, work on your PC while your are in the traffic or outside. Plus one step to manage all your public clouds or sync files among your PC and devices in a click. 2T2R Dual Band 2.4/5GHz antenna. Gather your ASUS WebStorage, Dropbox® , Google Drive™, and SkyDrive® accounts in one place and even backup to PC at the same time! More links for "X99-Pro Intel X99 (Socket 2011) DDR4 ATX Motherboard"
The motherboard served me well for the past 2 months. Didn't have any problems. Works exceptionally well with my i7 5820k. And my two GTX 980Ti's. 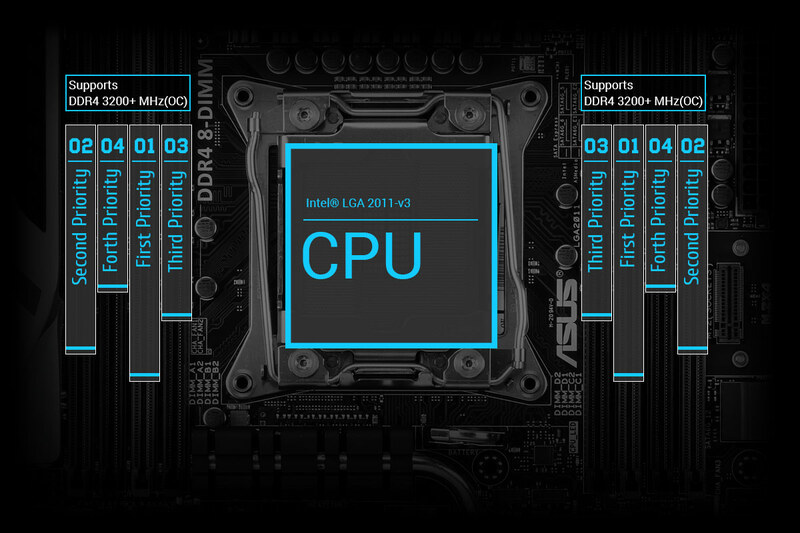 This is going to be my fifth Asus motherboard in my life. 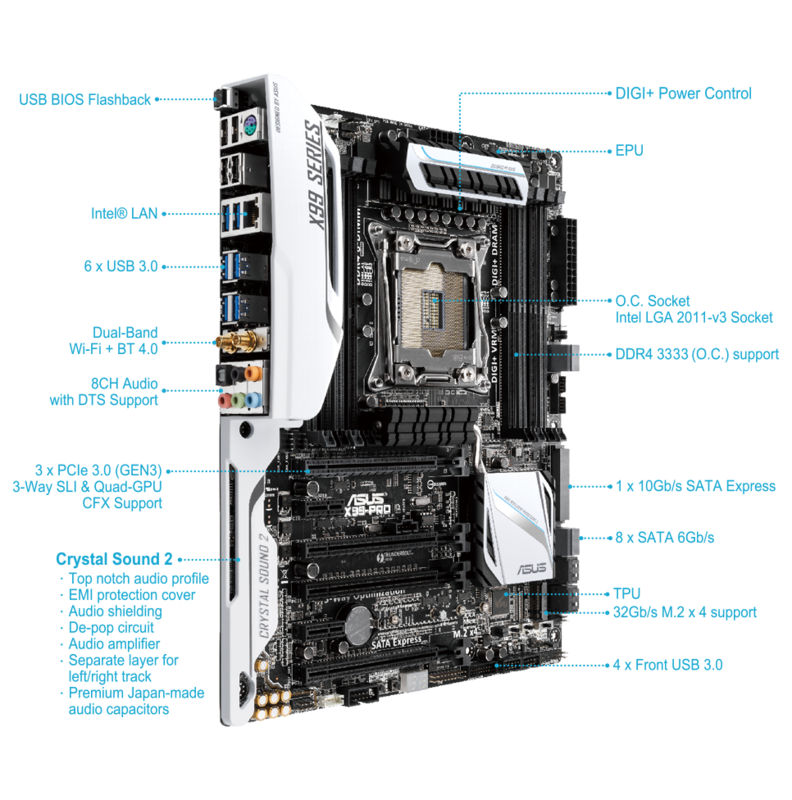 I don't normally write reviews on motherboards but I think I should for this one. I have been using this motherboard for about five months now and found couple of good things and bad thing. - The motherboard does not produce much heat. Overall, the temperature of my cpu (5820K) and my GPU (Strix 970) are kept lower. I don't remember the temperature readings but it was around 30C if I remember correctly. - I like the design of the board. It does look like a white sports car but I really like the motherboard layout. - I think the voltage across the board is too low at default settings. This is noticable when you overclock the CPU and the RAM (I have Platinum DDR4 2666mhz). Also, some USB peripherals which doesn't require any software drivers, such as my Blue Mic, doesn't work unless I replug it everytime I start my computer. This is a clear sign that the adequate power is not given to the motherboard. This does not happen on my other motherboard, Msi Z97 Gaming 7 which has an additional power adaptor for the motherboard. - The XMP profile does not work out of the box without tweaking the RAM voltage. By default, RAM speed is set to 1333mhz. Trying to set XMP profile will raise the Front Side Bus speed (in the motherboard BIOS, it says as CPU strap)as well. As a result, it will raise the CPU speed as well which is OK but it is not fully stable unless you set the CPU and RAM voltage manually. - The new Asmedia USB3 driver will screw and mess your PC. It will not allow you to post if you install this driver. Asus doesn't yet provide a fix to the motherboard BIOS in order to remedy the new particular driver installation. They are getting slow to release new drivers compared to few years ago. - I can overclock or mess with my BIOS settings to some extent but some settings does change the other ones and so, eventually, there aren't much things to play with the new BIOS. It is best to leave everything at default until ASUS release the new BIOS to fix a) the stable CPU overclocking issue b) The stable RAM overclocking issue with 2011 cpus. 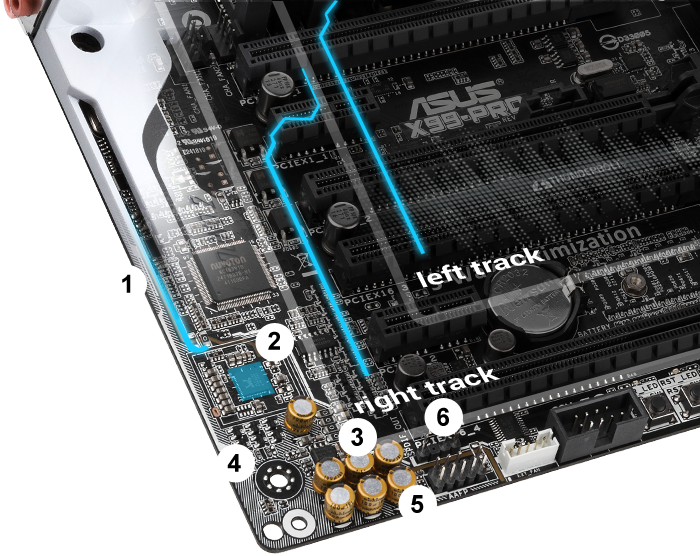 This is a known issue for X99 platform but since Asus has integrated this new idea to use CPU pins fully, I'd expect more from them. - Despite the fact that this motherboard is meant for enthusiasts, Asus didn't bother to put much attractive accessories in the box. The 'X' seal looks ugly design wise, driver disc is pretty basics and there was nothing else apart from few SATA cables and manuals. I don't mind in the end but I was expecting a bit of ... you know... a surprise when you open a new box. I will have to compare this with MSI gaming motherboard. They provide SATA cable straps (so that you can write which HDD/SSD on the straps) which is useful, humorous door hanger, and a solid nice seal of MSI along with a good driver disc ( the disc will check whether you have the necessary driver installed already). I wonder what has happened to Asus but to be honest, no matter what Asus products I use, the reliability is not a top notch from my experience. My Z87 Deluxe motherboard is working OK but one day the BIOS corrupted, my old AM2+ asus motherboard had problem with memory slots and AM3 motherboard too, my old old Asus 4850 card broke in few months along with Gtx250 ( All at the time..), Today, my Xonar Essence STX 1 and 2 is working great so there are some which are quite good but again, it is a hit and miss. One thing I can say for sure, is that they are not rock solid. At least, not as much as they advertise. I really like their idea of designing components to use less power but that gives a lot of problems so far. Eg. My Asus 970 Strix is design to operate quietly but because of that, the heat rise when playing games and so, the FPS fluctuate due to throttles thus, the speed drops. I don't know whether I can recommend this motherboard. If one ask me, I'd say.... no.... not for now.